New for Mega Blaster World for 2016, we have NERF RIVAL opening in a BIG way with our Mega Blaster World Arena doubling up for two styles of Blaster combat, traditional blasters or Rival. 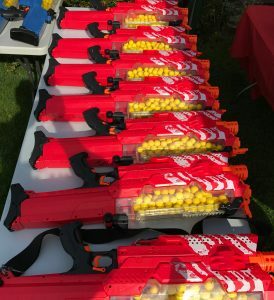 NERF Rival has been in the wings for almost 4 years and has finally landed on our shores aimed at the next generation of blaster hero’s who want more power, more accuracy, more distance before stepping up to Paintball. Inter-Office Battles known as Foam Ball Office Wars better known to us as F-BOW. It’s all the fun of Paintball without the pain and bruises, without the paint and mess. With 40 meter ranges, unbelievable accuracy, semi-auto and fully automatic blasters from September 2016, the ultimate indoor or outdoor blaster fun, the future is here with Mega Ball, blaster fun & games to ‘RIVAL’ Paintball. 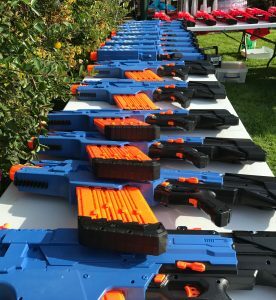 Whether it’s Accounts vs Sales, Parts vs Admin, Ground Floor vs Top Floor, Barclay’s vs Lloyd’s, Ford vs Jaguar, Office Wars are in, take your business to a blaster War and come away without a scratch! !